CW3E collaborators Michael DeFlorio (NASA/JPL), Duane Waliser (NASA/JPL), and Bin Guan (UCLA), along with CW3E director Marty Ralph and colleagues David Lavers and Frederic Vitart of the European Centre for Medium-Range Weather Forecasts (ECMWF), recently published a paper in the Journal of Hydrometeorology titled Global Assessment of Atmospheric River Prediction Skill (early online release; doi:10.1175/JHM-D-17-0135.1). The study introduces the Atmospheric River Skill (ATRISK) algorithm, which is an object-based approach used to quantify atmospheric river (AR) prediction skill using Subseasonal to Seasonal (S2S) Project global hindcast data from ECMWF. Two decades of data from this ensemble hindcast system were used in this work. The ATRISK algorithm determines the distance between the centroids of observed and forecasted ARs (an adjustable parameter; see Fig. 1), which can be used to compute relative operating characteristic (ROC) curves. DeFlorio et. al (2018) shows that climate variability conditions modulate regional AR forecast skill. 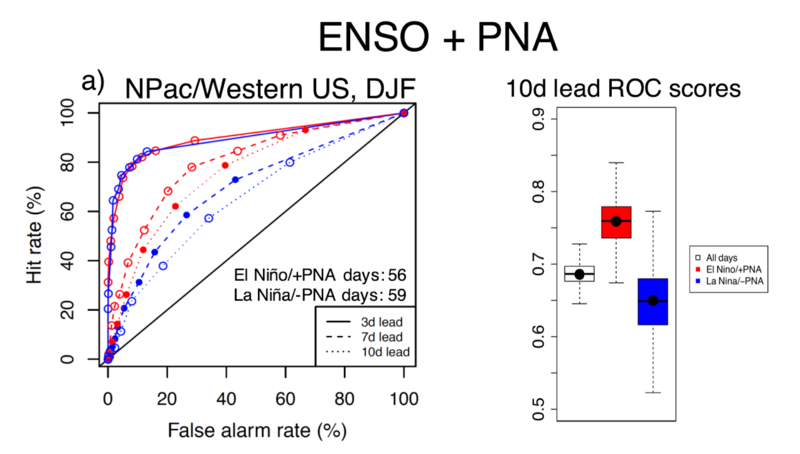 In particular, over the US West Coast, AR forecast utility (defined as the ratio of hits to false alarms) decreases at 10-day lead during negative Pacific-North America (PNA) conditions, and increases at 10-day lead during positive El Nino and Southern Oscillation (ENSO) conditions, with an even larger increase in AR forecast skill during phase-locked El Niño and positive PNA conditions (Fig. 2). Figure 1: Figure (2) from DeFlorio et al. 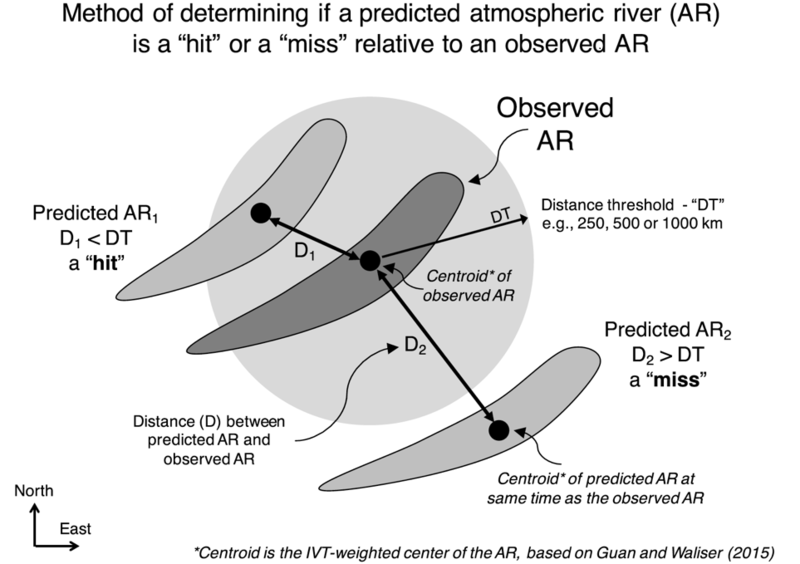 (2018): Method of determining if a predicted atmospheric river (AR) is a “hit” or a “miss” relative to an observed AR. Predicted and observed ARs are shown as shaded light and dark shaded ovals, respectively. Their IVT-weighted centroids are shown as black dots, and the distances D1 and D2 between each predicted AR and the observed AR are shown as black arrows. The distance threshold DT, which indicates the acceptable horizontal distance between an observed and predicted AR for a prediction to be considered skillful, is shown as a black arrow. In this example, the prediction of AR1 is considered skillful (a “hit”) since its centroid falls within the distance threshold of the observed AR, while the prediction of AR2 is not considered skillful (a “miss”) since its centroid falls outside the distance threshold of the observed AR. Figure 2. Figure (10a) from DeFlorio et al. (2018): Relative operating characteristic (ROC) curves composited on positive (red) and negative (blue) phases of the combined El Niño-Southern Oscillation (ENSO) & Pacific-North America teleconnection (PNA) modes in December-January-February (DJF) over the North Pacific/Western U.S. region. The 1000 km distance threshold is used, and positive and negative phases are defined using +/- 0.5 standardized values of the climate index for each mode. 3-day (solid), 7-day (dashed), and 10-day (dotted) lead times are shown. The number of positive and negative phase days for each combined mode phase are listed above the legend. Area under ROC curve distributions for both region/mode/lead times of relevance, calculated from a bootstrap process that was repeated 1000 times by using resampling of the composite positive and negative mode days (red and blue, respectively) and all days (white) distributions with replacement, are included beside the ROC curves.